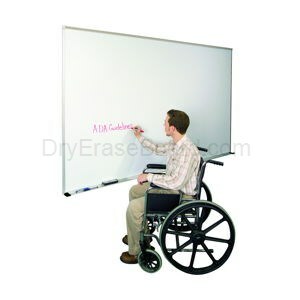 This El Grande Porcelain Premium Marker Board is bound to grab attention. It is perfect for preschools (as well as public meeting spaces, computer labs and the like) because of its five foot height. In addition it provides better contrast and reduced surface light distortion, is height adjustable, made of anodized aluminum and features accessories as well. • Reduced surface light distortion and better contrast for increased visibility and no ghosting. • Height adjustable so it can be seen in multiple room sizes. • Extras Dura-Safe corners, accessory trays and a full-length map rail. Included: L-clips, screws, rawl plugs.